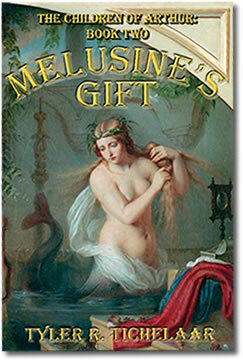 My Newest Novel, “Melusine’s Gift: The Children of Arthur, Book Two” Is On Sale! Marquette, MI, January 13, 2015—What made medieval royalty want to claim descent from a shape-shifting fairy? Whether a mermaid or a flying serpent, Melusine of Lusignan was seen as a desirable ancestor by many noble and royal houses of Europe, and she was both reviled and celebrated by medieval audiences. Now she tells her own story in award-winning author Tyler R. Tichelaar’s new historical fantasy novel Melusine’s Gift: The Children of Arthur, Book Two. What would you do if you found out that your wife was a mermaid? According to legend, Raimond, Count of Lusignan, met the beautiful Melusine at a forest fountain. They fell in love and she agreed to marry him if he promised never to disturb her when she locked herself away every Saturday. Raimond agreed, but fearing his wife was committing adultery, he eventually spied on her and discovered she was a mermaid. Later, when tragedy struck their children, he lashed out at his wife, calling her a serpent. Heartbroken, Melusine sprung wings and flew out the castle window, her serpent tail trailing behind her. In Tichelaar’s first novel in the series, Arthur’s Legacy, twentieth century Adam Delaney, an American-born young man, meets the wizard Merlin, who reveals to Adam that he is a descendant of King Arthur and his family will aid in fulfilling the prophecy of King Arthur’s return. Now in this sequel, Adam and his English wife are on their honeymoon in France where they discover their family’s connection to Melusine. This knowledge will aid them in the future when they must fight forces determined to stop Arthur’s return. Tyler R. Tichelaar, Ph.D., is the author of numerous historical fiction novels, including The Best Place and the award-winning Narrow Lives as well as the scholarly books The Gothic Wanderer and King Arthur’s Children. Melusine’s Gift: The Children of Arthur, Book Two (ISBN 9780979179099, Marquette Fiction, 2015) can be purchased in paperback and ebook editions through local and online bookstores. For more information, visit www.ChildrenofArthur.com. Review copies available upon request. 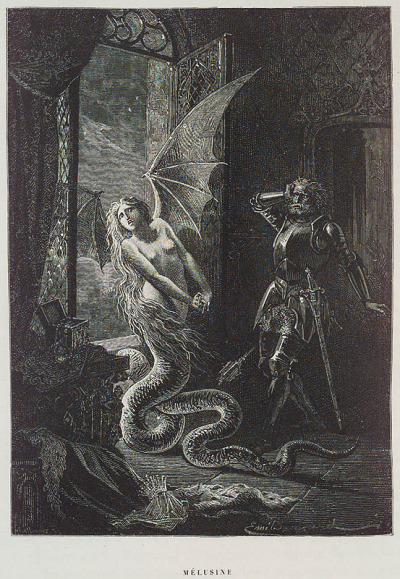 An engraving of Mélusine from P. Christian’s Histoire de la Magie, 1884 – Melusine’s story definitely has its Gothic implications if we choose to see her as a monster or demon or even just a woman with a secret – hopefully my new novel has redeemed her.